2 The Catal NEWS OF THE WORLD October 31, 2001 War prolonged by Taliba reso ve by enee Maxwell De pite aggressive air strikes on Afghanistan that have succeeded in wiping out the Taliban s air force, Pen tagon officials fear chat the road to vic tory may be long and full of pitfalls. According to reports from tho e who have r cently left Afghanistan. the members of the Taliban regime arc eluding military strike by hiding out in civilian neighborhood Though the military facilitie of the Taliban have been crippled and the terrorist training camps are leveled, Osama bin Laden and the Taliban officials remain un touched. Pentagon briefers describe lhe Tal iban as "battle-hardened survivors" and are thus trying to prepare Ameri can for a prolonged conflict overseas. evertheless, both Wa hington and London are reluctant to employ a majo ground army in Afghani tan. The point of this tactic is to avoid the mistakes made by the Soviets. complicated by Afghanistan's harsh landscape and the shifting loyalties of various ethnic groups. Even experts who support military action have criticized the strategic. of m r n i bourg, chairman of the International In-rifuce for Strategic Studies, said "I can not ay who has the strategic initiative in this conflict ... It is starting to look as if they are bombing and bombing and bombing just because it is what they know how to do.'' According to Heisbourg, Washing ton would have gained a tangible strate g i c advantage if it had focu ed on an early takeo er of Kabul, thus under mining the legitimacy of the aliban regime. Bush officials counter that if the Northern Alliance. backed by Wash ington, had sei1.-ed Kabul, rival ethnic groups have aligned themselves with the Taliban instead Anthrax earch continues around Washington Anthrax has been found in trace amounts in th offices of three con gressman in the Longworth House Of fice Building, according to officials on Capitol Hill. The building has been closed for testing since Oct. 18, and mail deliverie to the Capitol complex were cea ed before then. The anthrax pores were di covered in the offices of Reps John E. Baldacci, D-Maine. Rush Holt, D-.J., and Mike Pence, R-Ind. The Supreme Court building was also ordered hut down for testing Friday, since the mail center that services that building was found to be contaminated in Langley, Va. In addition, small amounts of anthrax were discovered at a CIA mail facility, which was also closed for testing. Two po tal employees and a mail room worker for the State Department have been diagno.ed with the inhaled form of anthrax. The post office al oreported that 23 other workers in the Washington area have been hospital ized with symptoms that are imilar to anthrax, but the diagnosis has not been confirmed. evcral other people are skin fonn of anlhmx. Approximately 68 tons of mail from Washington has been lrucked to a facil ity in Lima, Ohio. to be decontaminated with electron beams normally used by hospitals to sterilize equipment. The post office has also signed a $40 mil lion contract to purchase eight such electron beam devices to sterilize the mail at Washing on mail centers. The head of the Center for Disease Control and Prevention stated that it was almost certain that there is at least one piece of undiscovered contaminated mail in the nation's capital. Since the anthrax spores have spread to mail handling facilities in Washington, Maryland, and Virginia, it is "highly Mullah Qatradu/lah JanUJI, Minister of bifomwtion of Taliban. gestures as he charCicterizes America11 air campaign. lle called it a war against Islam. unlikely to irtually in possible" that th letter received by Tom Daschle could be responsible for all the contam ination that has surfaced in the last three weeks. Officials also cautioned again t pre mature allegations of responsibility for the anthrax. 'o pecitk su pect have i 1 a ries are being considered, including the pos ibility that a psychotic U.S. resi dent with biochemical training, a terror ist or hate group. a foreign country, or some combination thereof may be re sponsible. ush 's controversial Anti-Terrorism bill passes President Bush signed a new Anti Terrorism bill Friday that gives police and intelligence agencies considerably more power. Thi legislation broadens the authority of the FBI to conduct wiretapping and electronic surveillance operations, imposes harsher penalties for harboring or financing known ter rorists, increases the types of crimes that fall under t rrorist acts, and tough ens the punishment for committing those acts. 'This law will give intelligence and law enforcement official new tools to fight a present danger," Bush said Legaslator had the foresight to place a four-year cap, on \he part of the c i a tO w ic 111 ves mtercep mg com munications, including Internet and e mail communications, in order to address concerns of abuse of the law. Though the law is somewhat weak ened from the administration's original proposal, critics still fear that this bill i dangerously strong and may infringe upon the constitutional rights of law abiding citizen Sen. Russ Feingold, D Wis., the only senator to vote against the package, said, ''This bill does not strike the nght balance between em powering law enforcement and protect ing civil liberties." Information from the Associated Pre s used in this report. C A 1ALYS1 The Catalyst is available on the World Wide Web at http://www. sar. usfedu/-catalystl Prince of Darkness Michael Myersson Queen of the Harpies Erin Sparkle ec::romancer Michael Ghoullani Lord Executioner Max-d axe Murderer Soul tealer Crystal Hellrai er Bloodsucker Graham Straker Evil Minion Ryan McCormick Fright, Esq David Slasherese, Valerie MoJekyll, Jag the Ripoer. Countess Cl cula, Christopher DeFreaky, Renee Axewell, Liz P ycho, Abby Weregarten ote: This is a special halloween issue. The names and titles to the left are not actually real. The Catalyst is an academic tutorial sponsored by Professor Maria Vesperi. It is developed in the New College PubJications Office using Adobe Photo hop and Quark Xpress for PowcrMacintosh and printed at the Bradenton Herald with money provided by the ew College tudent Alliance. Direct submissions and inquiries to: he Cataly. t 5700 N.1amiami Tr. Box #75 Sarasota. FL 34243 catalyst@virtu.sar.usfedu Tlze Catalyst reserve the right to edit submis ion for space, grammar or style. Contributions may range in length from 250 to 500 words. Letters to the Editor should be no more than 250 words. Submissions should be labeled as either Letters to the Editor or contribution and include names and contact infonnation. Printed submissions may be placed in campus box 75, and all other contributions may be e-mailed to catalyst@v;rru.sar.usfedu. o anonymous ubmissions will be accepted. All su_bmissions must be received by 5:00p.m. m order to appear in the following week's IS ue. Information about upcoming events is welcome throughout the week. The Catalyst NEWS Resident Assistants accidentally assist in tire theft by Abby Weingarten Two New College Resident Assistants inadvertantly became acces sories to theft last Friday when they helped two out-of-state criminals change a tire in a Hamilton Center parking lot at 4 in the morning. The tire was stolen from the car of another RA, third-year Heather Holtschneider. The two men were later arrested, and one faces felony charges in Maine. Third-years Jonathan Frommer and Liz Collins were driving back from a studio in the Caples Fine Arts Complex when they noticed two men in their late teens or early twenties attempting to change the front right tire of their Toyota Camry. "Something was immediately wrong with this car. It did not belong where it was," Frommer said. "They didn't look like students. They didn't have a USF parking decal or anything, and Liz said they asked her what this place was." Lopsided, the car was sitting on its rotor. ''They were trying to jack up their car and they had no idea what the hell they were doing," said Frommer. They asked the tw? men they needed help but. they declined Sttll wanting to be of asststance, they brought over a flashBut by that time, the men had already up their car and were replacing the tire. On RA duty at the time, Frommer immediately took down the Maine license plate number and walked off the lot with Collins to make some Officer Roarty said, "New College students have to wake up." light to replace the lighter the men were using, and showed them the ropes. "We were good Samaritans," said Frommer. :we showed them how to put on the ttre, made sure they didn't hurt their car." However, into the changing of the ttre, Frommer noticed another lopsided car parked right beside them, another Toyota Camry missing its left tire. Frommer recognized that it belonged to Holtschneider. "I cannot believe this is happening," Frommer claimed he said to himself. phone calls. By the time they got a hold of a dis patcher. the two men had finished the job and taken off in their car. About two minutes later, Officer Kathy Jacobs of the University Police arrived at the scene. After doing a background check on the plate number, it turned out the car wasn't hot, but it was in fact registered under a woman's name. The two men were arrested by Bradenton police a few minutes later, and Officer Walker of the University Police went to the 5 scene. One of the men had a warrant for his arrest out in Maine on felony charges. "I got out of bed, went over there, they told me the story, and I thought it was pretty funny," said Holtschneider. The cops asked her if she wanted to prosecute but, "I just want my tire back," she said. "I don't care." On Monday, she retrieved all of the tolen merchandise: her tire, lug nuts, and hubcap. Officer Roarty of the University Police said, ''New College students have to wake up. Two RAs were acces sories to theft, by helping off campus ne'er-do-wells place a tire on their car that they had just stolen from a New College student's car." But Frommer responded, "I can't be lieve Roarty said that we were accessories to theft. He made it sound as if we helped steal." ''They did a good job," said Holtschneider. ''They didn't mean to be accessories to theft." Review team identifies strengths, flaws of Environmental Studies program by Jag Davies Last week, the much-maligned Environmental Studies program received a boost of fresh air, as well as some creative and practical advice, with a visit from a highly qualified Environmental Studies Review Team. After evaluating the program's strengths and weaknesses, they offered students, faculty, and administrators a number of suggestions, including the hiring of a new faculty member who would pecialize in environmental studies. The Review Team consisted of Harold Ward, Professor of Chemistry and Environmental Studies at Brown University, and Eric Pallant, Associate Professor of Environmental Studies at Allegheny College. ''I'm going to trust what they have to say, because they have experience not just with environ mental studies in a college environment, but with environmental studies as a field of study itself that the faculty here just doesn't have," said professor Aron Edidin, a one of the three members of New College's Environmental Studies Steering Committee (ESSC). The Review Team had quite a busy schedule during their two-day stint at New College. On Thursday, they had separate meetings with the Environmental Studies Steering Committee, Provost Charlene Callahan, President Michalson, the Natural Sciences Faculty, the Faculty Academic Status Committee, the Green Campus Research Seminar, a group of New College students interested in pursuing environmental studies, and local alumni. On Friday, they had breakfast with local community partners from Selby Gardens and Mote Laboratory, followed by separate meetings with the Humanities Faculty and the Social Sciences Faculty. Then, that afternoon, they presented their findings to students and faculty at an exit discussion in the College Hall Music Room. At this discussion, the Review Team identified several strengths already in place to create a good environmental studies program at New College. These included the physical environment of Sarasota, the thesis requirement, and the open-mindedness of faculty, admin istrators, and students. According to Review Team member Eric Pallant, New College already has "all the pieces you need to run an ideal program." However, they also identified a number of weaknesses, including structural problems (since environmental studie can not fit neatly into any of the three pre-existing academic divisions), New College's rigid tenure structure, a lack of money, and a lack of institutional commitment to the program. As expected, the Review Team's primary recommendation was to hire an Environmental Studies faculty member, preferably with a lot of experience and the ability to cross inter-disciplinary lines. This new faculty member would teach an introductory seminar course in level provide the practical KnlrlWiei'lrve sary to guide environmental studies majors through their time at New College and beyond. Last year, the ESSC had proposed that New College hire three new envi ronmental studies faculty-one for each division but the Review Team claimed that this would be too costly and yet still fail to establish the pro gram as a distinct field of study. According to Review Team member Harold Ward, "Environmental Studies falls right in the middle of all three di visions, and hiring a faculty member that owes allegiance to any one of them would fail to give the program the di rection it needs." Other recommendations included strengthening the ESSC by including two members from each division rather than just one, allowing Jono Miller and Julie Morris to sponsor ISP's and theses ("they are perfectly capable," said Pallant), and creating a more specific, reliable curriculum for environmental studies majors. They also advised that New College establish stronger connec tion with local institutions such as Mote Laboratory and Selby Gardens, by making it easier for students to use these resources and allowing the direc tors of these institutions to sign off on theses. They also urged that, in the meantime, only members of the ESSC should be able to sign off on contract for students who are concentrating in echoed those of lhe Review Team. Although no reliable statistics are avail able, it appears that a significant number of students have either left New College or have switched out of the en vironmental studies program due to its lack of depth. ''There are a lot of stu dents who are leaving the school, because they are not finding what they want in the Environmental Studies pro gram. Even if we can get one faculty member who can work closely with Jono and Julie, it will make a big dif ference," said second year Theresa Shoumate. According to student Environmental Studies Representative Jessica Noon, ''The main issue is that we don't have a faculty member. I have suggested to the committee that we just create a separate environmental studies department, but the faculty insists that it somehow has to fit into one of the pre-existing three divisions." "I think what we really need is two new faculty members: one for environ mental studies, and one for humanities or social sciences, who can help stu dents who are more policy-oriented," said transfer-student Kit Reilly. "We need faculty that can go in-depth. I think students recognize that, and I think that the faculty realize that too, but they are just facing the limits of lite budget and what-not." 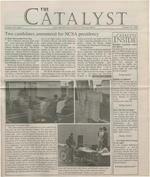 The Catalyst HALLOWEEN ENTERTAINMENT October 31, 2001 7 Investtgattve report: Is Cook Hall haunted by former Dean Bassis? by Max Campbell "Even New College has its fair share of ghost stories, myths, nd legends," a Catalyst reporter rote, two years ago to the day f the upcoming New College lloween PCP. Back then, the ain focus of supernatural activ 'ty and inquiry on campus was he historic Old Caples estate, 'that mysterious old house that often the target of students king for an otherworldly ex rience." Today, however, there is a ew legend on campus, rumors of which are slowly gaining cur ncy among the faculty, staff d campus police. This legend gan on July 14 of this year. astille Day ... the day when for er Dean and Warden Michael assis accepted his last, enor mous paycheck, and disappeared from the face of the earth. ince then, there have been re rts of eerie noises in the halls and offices of Cook Hall; of aranormal phenomena, and the mysterious sightings of a familiar face. Some have beun td whi per t as never left th Humanities Chair Glenn uomo told the Catalyst that assis vanished abruptly after cepting his final check and eave of absence. "There hasn't n a [confirmed] sighting of im since that weekend," he aid. "He just packed up his ings and left." He admitted, however, that ere has indeed been some circumstancial evidence that Bassis might still be near. 'The pouse of one faculty member thought she saw him in a local restau rant," Cuomo said "And I think I once saw his car at Cook Hall." Along with the signs and portents which Cuomo cited, there has been a ra h of paranor mal activity in the building, which might ea ily be attributed to Bassis him elf. The staff re sponded to questions on the sub ject with skepticism, but with a certain revealing sense of gal lows humor, as well. "Every time the printer goes on, we get an interesting memo no, not really," laughed Of fice Assistant Vikki Devine. "[Bassis] can't access the com puter from where he is now Or can he? Stella Krasteva McCauley, a student assistant who also works in Cook Hall, has long been the victim of a possible supernatural occurrenee. "I didn't work here when Dean Bassis was here," she said, pointing out a nearby office [by itself} every day. It's turned on when I get here. It's not on right now, but it will be turned on again tomorrow." She professed not to believe that Dean Bassis was responsi ble. French Professor Amy Reid told the Catalyst that she has dis cussed the possible haunting, at least once, with a member of the Campus Police. The police themselves declined comment on any ghost-related investiga tion which might or might not now be in progress. It should be noted that, in general, it is police policy to refuse comment on in vestigations which are still out standing. Administrators are in dis agreement about the extent to which Cook Hall is haunted. Cuomo was quick to disclaim any firsthand knowledge of Bassis' otherworldly existence: "I can't say that I've seen any trace of him or felt his pres ence.'' "I very much do feel his presence, Vice President for Fi nance and Administration John Martin countered, "as part of his legacy for new college, as part of his good deeds." Martin, who was hired by Bassis, and now inhabits the former dean's office, theorized that "all that time and effort of his [Bassis'] towards independence is now paying dividends This might be evidenced by Bassis haunting of Cook Hall, perhaps .. can feel hrs presence,,.. Martin said, "in the way of inde pendence, in the way of the ex citing things and challenges it brings to us." In the end, however, Bassis' potential motivations in haunting Cook Hall are a mystery. Devine speculated that Bassis might eventually return to the Social Sciences Division office, as he is still a member of the faculty hanging over VP John Martin in this photo. there. The possibility of such a should bear in mind the immor visitation has been mentioned by tal advice of former student campus administrators before. Cierdwyn Lucker about apBut since his former dean's proaching ghosts: "go about salary would then be adjusted, it your daily business and be re is uncertain whether Bassis will spectful. Don't expect to see any ever return to haunt the Social thing, because you probably Sciences Division at all. won't. If you do, be respectful." Therefore, when entering Bassis himself could not be Cook Hall, staff and students reached for comment. is Saturday's Palm Court Party not for squeamish, sensitive types REtURN OP T.KE SON OP T.KE NIGHt OP T.KE LWJNG PeP PMT. It T.KE REVENGE This years PCP T-slrirt logo. by Renee Maxwell The theme of this weekend's upcoming Palm Court Party will be "Horror Movies," or more specifi cally, "Old, Bad Horror Movies." So beware the faint-hearted, this is not an event for squeamish, sensi tive-types. It is, however, in the spirit of Halloween that all the blood and gore of bygone slashers will be commemorated. The title of the event is "Return of the Son of the Night of the Living PCP Part 2 The Revenge." Throughout the night horror movies will be projected for the viewing pleasure of the attendees. In addition, there will be live bands in Palm Court and DJ's in the third court lounge to provide music for the less blood thirsty partygoers. What will not be provided, however, is alcohol. The lack of kegs, though a significant departure from the popular PCP tradition, is in no way meant to hinder (responsible) alcohol con sumption at the event. Rather, it is a consequence of increased security measures associated with alcohol provisions and the cost of that secu rity. The PCP is being organized by fifth-year Dann Holmes, secondyear Christopher Altes, third-year Michael Howland, and second-year Mark Hengge. Holmes and Altes told the Catalyst that since alcohol is not being provided by the school, no wristbands need to be issued and only minimal security is required. Therefore, the decision was simply a matter of reducing cost and sim plifying preparations. Students will still be asked to register off-campus guests with Student Affairs, however, as a standard security precaution. The PCP organizers also emphasized that bottles will not be allowed in Palm Court and encouraged everyone to opt for cans instead. In preparation for the nocturnal activities, the organizers are also sponsoring a scavenger hunt to be held that day, for which prizes will be awarded. What those prizes will be was not revealed to the Catalyst, so in the meantime hopeful participants will have to remain in suspen e. But as Christopher Altes promised, "It will be a magical, magical evening." And while students "stumble in somnambulance" around Palm Court, they can revel in the horror of Leatherface, Freddy and Jason. So don't forget your chainsaw, because according to Altes, "Leatherface, it's all about Leatherface." 8 The Catalyst ANNOUNCEMENTS October 31,2001 .. 12:35 p.m.: Petit -New College student re lheft of an unsecured nrvr .. from the Goldstein Dorm ... 3:50 p.m.: Trespass -Non-affiliated male was .. rt at the Caples Fine Arts during the Red Cross raiser when he refused to campus Subject was intox and in possession of lalCI:>hoJ ("dry event) County Jail. Sarasota Mahayana Buddhist Meditation Group Wednesdays 8:00-9:30 p.m. College HaU Music Room The Sarasota Mahayana Buddhist Meditation Group meets weekly to study and prac tice traditional Mahayana Bud dhist meditation. Participation is open to all: it requires no prior Theft -Bicycl e New Coll e ge student r eported the theft of her unsecured green 2 6 3-speed ladies Raliegh bike from a bike rack in Pei Dorm East (2nd court). Value : $700.00 10.21.2001, 12:15 a.m.: Battery/Criminal Mischief Two unknown males "egged" a New College student and couch in Hamilton Center fled the area in a BMW. Total damage: Approx. $55 .00 10.22.2001, 12:27 p.m.: Pet it Theft New College student re ported theft of his satellite dish from outside his room. Value : $55 00. Dish was later recovered 10.22.2001,9:08 p.m.: Attempted Grand Theft Auto -A USF student discovered that an unknown suspe.ct had entered her car and attempted to start her car. Approx. $300.00 damage to her ignition system. 10.22-2001, 9:08p.m. : Grand Theft Auto -USF student dis covered that an unknown suspec t knowledge of or commitment to Buddhism. Attendance is free of charge. If you wish to sit on the floor in traditional meditation posture, bring a pad or blanket and a finn cushion (the room has a hard wood floor). Chairs will also be available. $4 000 .00 value Vehicle entered in FCIC/NCIC and later recov ered by the Manatee County Sheriff 's Office 10.22.2001, 9:00 p.m.: Attempted Grand Theft Auto Non affiliated guest reported the attempted theft of his vehicle f rom Pl1 ( Twining), near air port. Approximately $600.00 damage to the vehicle 10.23.2001, 2:10p.m. : Attempted Vehicular Burglary -Sudakoff Lot. New College student reports that unknown suspects attempted to gain entry to her vehicle by prying the pas senger door lock mechanism. Approx. $300.00 damage to door. 10.26.2001, 3:47 a.m.: Theft From Vehicle -New College student reports theft of tire from her vehicle. Approx. total loss: $185.00. Two suspects involved, on f v i-cle and investigative leads. Board of Trustees meeting: November 3, 2001 !O:OOa.m. College Hall Music Room For more information or a copy of the agenda, contact Suzanne Janney, Special Assistant to the President CAREER CENTER What's Happening? Thurs Nov. 1st 5:00-7:00 p.m. All About Law School and After, Diversity Center Lawrence Vernaglia Esq an attorney for a major Jaw firm Hinckley & Allen in Boston, and a member of the New College Alumnae Board of Trustees will discuss law school and life after law school. Internship Ocean Mammal Institute Internship is from January 4 -23 2002 in Maui. This intern ship to continue their studies on the impact of human ma rine activities on endangered humpback whales. During the day students help collect data in the field; in the evening at tend lectures and discussions about the research and rele vant marine conservation issues. Expenses: $ 1 950 plus airfare, food, and course read ing material. Full payment must be made 60 days prior to departure. To find out more check the website: www.oceanmammalinst.org. The Harlem Renaissance and the Anthropology of Performance All events begin at 7:30p.m. in N o vember 7 J ess e B. Simple: Characterization in the Fiction of Langston Hughes. Kwabena Dinizulu, St. Petersburg, FL. Theatrical perfor mance and discussion November 20 "Acting in the Living Museum." James Horton, Ph.D., Department of History, George Washington University and the Smithsonian Institution. How the Other Half 'Lives' by Christopher DeFillippi (1/RrsT, I (oVI.JII'T JJE HAVINc; Alff lf5S LV(/< WITH THE LADIs W!THocif HAVING A foU fiE LIJ ARo"IID Jttf r;IIY PMTS/ WHAT GIV!5?